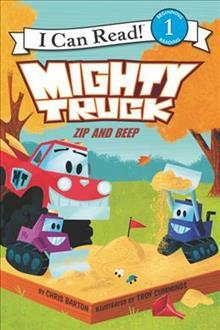 Mighty Truck is super strong, super fastEand a super fun babysitter! When Hattie's bulldozer cousins Zip and Beep visit Axleburg, Clarence offers to watch them on his day off. How can Clarence keep up with these wheely energetic youngsters? Sounds like a job for Mighty Truck! Ful... read full description below. Clarence was just a muddy pickup. One day there was a big storm, and lightning zapped the car wash. Now Clarence has a secret: Water turns him into MIGHTY TRUCK! Mighty Truck is super strong, super fast . . . and a super fun babysitter! When Hattie's bulldozer cousins Zip and Beep visit Axleburg, Clarence offers to watch them on his day off. Zip and Beep play tag, kick the can, and jump jumper cables-but no matter how fast they zoom, Zip and Beep just don't run out of gas! How can Clarence keep up with these wheely energetic youngsters Sounds like a job for Mighty Truck! Mighty Truck: Zip and Beep is a Level One I Can Read book, which means it's perfect for children learning to sound out words and sentences. Chris Barton really loves writing books such as the bestseller Shark vs. Train, the Robert F. Sibert Honor Book The Day-Glo Brothers, the Mighty Truck series, and Attack! Boss! Cheat Code! A Gamer's Alphabet. Chris and his family live in Austin, Texas. Troy Cummings has written and illustrated a number of books, including the Mighty Truck series, Giddy-Up, Daddy!, and the Notebook of Doom series. He lives in Greencastle, Indiana, with his nice family and mean cat.